The cover of Harper’s Weekly on July 13, 1878, shows a distinctly Edward Gorey-like illustration of a man seated on slim metal frame, suspended from what looks like a Tootsie Roll. Far below this airborne man are the tops of lofty mountains. In what would later be described as “the first flight of a man-carrying dirigible in America,” aeronaut Mark Quinlan piloted a machine designed and patented by Charles F. Ritchel, the inventor credited with designing, among 150 other things, the first balloon that could be steered. 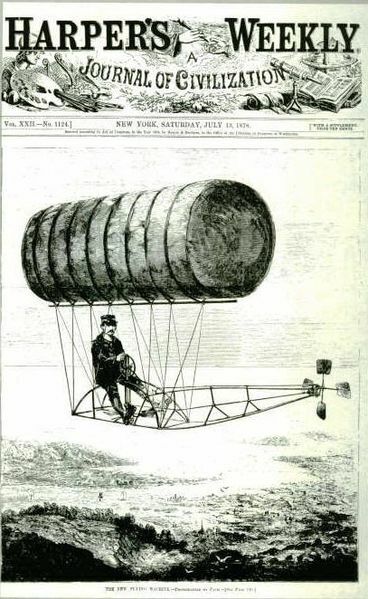 Quinlan’s flight on June 12, 1878, when he sailed from a Hartford baseball field near the Colt Armory out over the armory itself, the Connecticut River, and then returned to make a safe landing, was national news. Ritchel hailed from Bridgeport, where he had fashioned the “Ritchel Flying-Machine” at a machine shop there. He envisioned larger versions of his flying machine making possible long-distance air travel, with crews of men hand-cranking the craft. A crowd of amazed spectators had paid 15 cents admission to watch the June 12 flight, but the promise of Ritchel’s invention would not be realized for decades. The Connecticut Aircraft Company of New Haven would later build balloons, dirigibles and even blimps, which is part of the much larger story of Connecticut aviation. Ritchel’s other well-known invention was the fun-house mirror, which he called “Ritchel’s Laugh-o-Graphs.” Reflecting a distorted image of the viewer, the fun-house mirror was once a classic feature of carnivals and fairs. By several accounts, Ritchel died in Bridgeport in 1911, and despite his many inventions, was impoverished at the end of his life. But he had one great day, and it was in Hartford in 1878, when a lightweight pilot flew Ritchel’s dirigible above a crowd, over the river and back, then landed and climbed down from the craft to shake the inventor’s hand. Anne Farrow is the co-author of Complicity: How the North Promoted, Prolonged, and Profited from Slavery and is at work on a new book about slavery to be published by Wesleyan University Press. 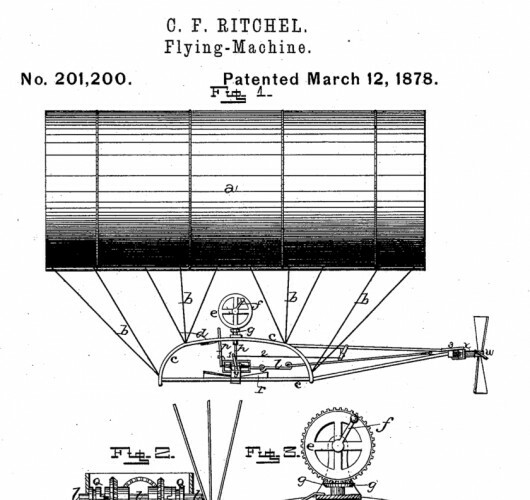 Ritchel, Charles F. Patent Number 201,200 - Improvement in Flying-Machine. 201,200. Pennsylvania, issued March 12, 1878. Link.